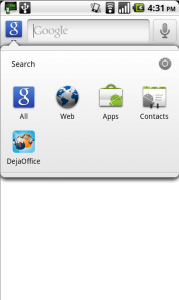 Today’s post is part 2 of a 4 part series that explains in greater detail some of the new features in DejaOffice 1.10.6 for Android. To read part 1, which discusses the new widgets, click here. Global search is a very useful feature in Android. It allows you to search through items on your phone, as well as online. Many applications support global search, allowing you to easily search through their data from the main search bar. This is an extremely convenient feature to have, especially when you have a lot of data that you’d like to access quickly. As such, we’ve added support for global search to DejaOffice! To get started, you’ll need to make sure DejaOffice data is included in search results. To do so, simply tap the search key on your phone. Next, click the Google icon in the top left corner. This will display what types of information you are currently searching for when you use global search. 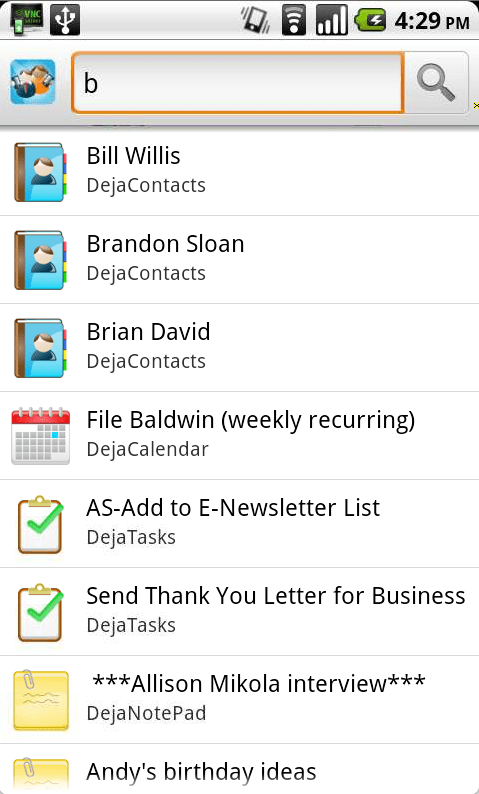 To add DejaOffice to this list, tap the settings icon on the right side of this screen. 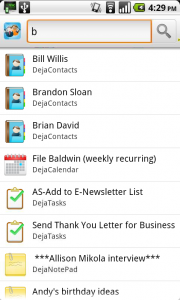 Scroll to DejaOffice in the resulting list and tap the checkbox to enable it. Now, a simple tap on the search key is all it takes to quickly jump to a contact, task, or calendar event! To have the search single out DejaOffice data, simply tap the Google icon in the top left, then select the DejaOffice icon. Be sure to check back in tomorrow to learn about the major UI improvements we’ve made to DejaCal. I have a feeling you’re going to love our new date picker! 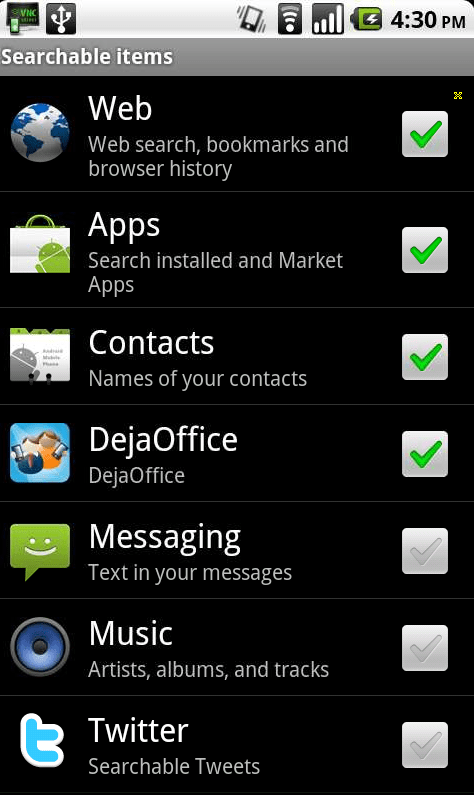 This entry was posted in Announcements, Support Updates and tagged android, dejaoffice, search, tips, updates by David. Bookmark the permalink.